‘Larger women have to try harder to look good,’ a stressed and frazzled mother said to her 12-year-old daughter, Rosie*. Rosie was a confident young girl, who embraced her body. She was, however, challenged by her mother’s harsh words. I feel for Rosie, being told the way you feel is not necessarily how you are perceived to be by others. Growing up is a tough gig: trying to find the perfect dress is one thing, but doing it when you are perceived as ‘plus sized’ is another. Most of my customers at working in a plus sized women’s clothing shop are mature women, not young girls graduating primary school. From my retail experience, women complain about the lack of style plus sized women’s clothing lacks; fashion is pivotal in the development of a young woman. It allows one to express their personality and create a common interest with their peers. Rosie’s mother insisted that she wear a plain maxi dress with a bolero but Rosie smiled at herself in an off-the-shoulder dress. I can also understand her mother – she wants her daughter to look good and actually wear what she buys, after all, she’s paying for it. Who is more correct? Rosie’s Mum represents society – forcing women to wear what others will approve of, not what Rosie thinks is beautiful. Believe it or not, 12-year-old Rosie has been the easiest person I have dressed, yet, it is the opinions of society that are difficult to undress. Like many women, myself included, have felt a lack of self beauty and self confidence, however, is this purely based on what society deems beautiful? Upon working at a women’s plus sized shop, I had never heard as many body shaming comments. It is immensely difficult to watch a horrified woman analyse herself and know her eyes interpret herself through beauty standards. You can feel a woman’s frustration and stress when nothing feels ‘just right’ and the perfect dress has been sold in a shop down the road that only has sizes which will not fit them. While it is difficult to get businesses to carry more sizes, I feel compelled to encourage women to carry a different attitude about their looks. Once – as inactive as I am – I was trying on active wear, and feeling as though things weren’t fitting smoothly. The sales assistant heard my moans and groans and said to me ‘don’t be so hard on yourself’. That is the best thing another woman was ever said to me. Those words are now what I say to my customers, but more importantly myself. Women develop a tendency to discuss appearances and fashion together and this is something I observe between strangers in my shop. Women coming together is empowering; a woman leaves happy and satisfied when another woman instils positivity in them. If women can come together, society too needs to embrace that beauty is diverse and encompasses many shapes and sizes – not just that which has been air brushed. I feel proud to be a part of society that is making progressive changes that embrace the true form of a woman and that beauty comes in many shapes and sizes. However, much change is required in women’s attitudes. Above all else, society should not dictate what women can wear and feel. So don’t be so hard on yourself. 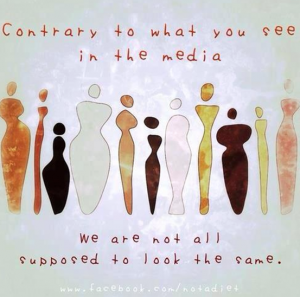 Beauty means something different for everyone and is not purely identified by the way we look. Let’s embrace our bodies for their beauty and accept that our imperfections might just be our perfections. When we accept that we are doing our best, we have confidence and therefore beauty – what I saw in Rosie was just that. *Names in this article have been changed. Findley Pollock is currently studying to be a dietitian and enjoys writing and speaking about all things health! In her spare time she enjoys finding cheap vegetables and exploring new places. Thanks Jane! I think it’s such an important and simple reminder we can all share! Thanks Honor, its such a simple message that I think needs to be spread! This entry was posted in Health, Life, Opinion and tagged beauty standards, body, body image. Bookmark the permalink.